Some of my most popular collections and prices are listed below. 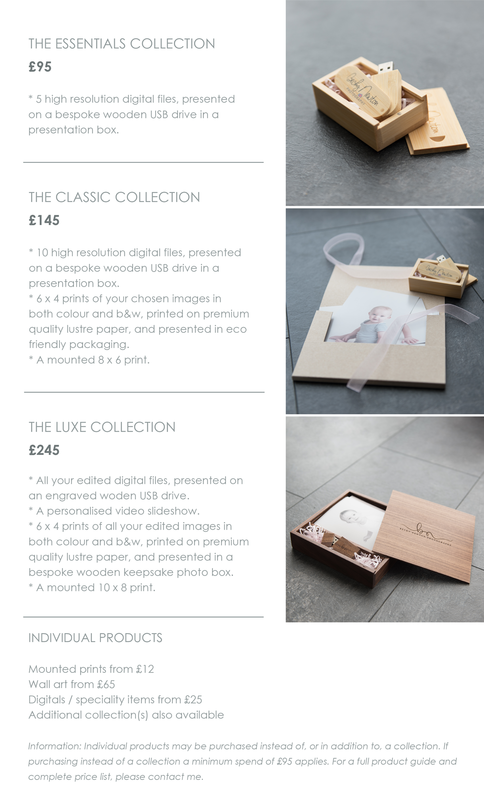 If you would like me to send you my complete pricing guide including all the different products I have available, or if you have any questions about any of the products I offer, please contact me and I will be happy to send you a product guide or reply to your queries. All digital images include full printing rights. I accept payment by cash, credit/debit card, and PayPal. Please note that product prices are in addition to session fees; session fees are payable at the time of booking, and you may choose and purchase products separately at your leisure once your online gallery is open. I loved the slideshow video, it made me cry! Thank you again!